Built in 1862, Hutton Lodge was named after John Hutton M.D. (d. 1712) who was a native of Caerlaverock who chanced to be in Holland during 1688 and was the nearest doctor at hand when the Princess Mary of Orange (wife of Holland's ruler, William of Orange and daughter of James II) met with a fall from her horse, and thus gained the regard of Prince William, who, on ascending the English throne appointed him his first physician. Dr Hutton gifted a sum of money towards the education of local children in the parish and the Hutton legacy allowed for the provision of a girls school to be built. Thus was Hutton Lodge built for the young girls of Caerlaverock parish to finish their studies by obtaining cooking, dressmaking, art and piano tuition. Three sisters, the Misses Glen, were appointed as teachers and resided in the house. They were Miss Christine as teacher, Miss Mary who taught art and music and Miss Agnes as housekeeper. The school was closed around 1900 and the children were moved to the adjoining building (now used as the community hall) together with the boys from Hutton Hall. Hutton Lodge was then used as a soup kitchen for the children's midday meals. 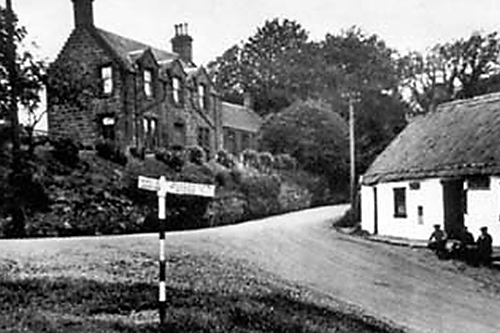 When all the children were moved to a school in the nearby Glencaple village during the 1940s the home was used as the village shop and post office until around the end of the 1950s when the building was used only as a residential building.